I can't remember exactly where I picked up this tidbit, but it grabbed my attention right away. 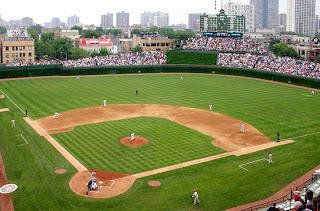 Just a few days ago, I learned that Wrigley Field, the home to the Chicago Cubs, didn't play its first night game until August 1988. It wasn't until then that Wrigley got lights. Before then, any games that went too late were called on account of darkness. And all games were day games. The first major league ballpark to get lights was Crosley Field, the then-stadium for the Cincinnati Reds - in 1935. Within thirteen years, every other stadium in the major leagues had them - except Wrigley Field. They waited, well, a bit longer. Finally, on August 8, 1988, ninety-one-year-old Cubs fan Harry Grossman turned on the lights, and the game between the Cubs and the Philadelphia Phillies began. But it got called anyway - at the bottom of the fourth inning. Not on account of darkness - on account of RAIN. I hope I'm not the only person who finds that funny. Can you imagine the bigwigs, excited about being able to watch their first Cubs game at night, only to be sent home six innings too early because of a bit of precipitation? All the publicity and planning that went into that game, and they didn't even get to finish it. It reminds me of me sometimes. I have some big idea - something I'm sure will be amazing. I do everything I can to make it happen - I dot my "i"s and cross my "t"s, invite the world, and start believing my own hype. And then something happens (maybe my fault, maybe not) - and it doesn't turn out just as I was hoping. In fact, sometimes it's a colossal failure. It's then that I can remember that it's not my plans that are important: it's God's. No matter how many plans I have in my heart, God's purpose prevails (Proverbs 19:21). And His plans are always - yes ALWAYS - better than our own. The Cubs didn't have to wait much long for their first official night game - rain held off the next day, and the Cubs beat the New York Mets 6-4 on August 9 of that year. Sometimes our plans are just a bit off - and sometimes we miss them by a mile. But it's good to know God's plans are always right on time. How hard is it for you to watch your plans fail? Do you need the perspective of Jeremiah 29:11 and Proverbs 19:21 as much as I do? Letting the Lord guide your steps can be tough in our self-centered society, where many just want to prove themselves, but it is always the best answer. I find that when things don't go as planned, it's usually because I made the plans without waiting for God's leading. He shows me (by making things fall apart) that He wasn't in it. Nice post! I tend to get caught up in my old plans and forget to check with God along the way. We came to Texas with prayer but when we got here, we just went ahead and made plans. Thankfully God stepped in and shut a lot of doors or us and has pointed us a different direction so this time I am praying all the way through! These are right words at the right time. Thanks for the post. I think if we all had super-spiritual vision, we'd see that the times our plans fail are often times when God is protecting us from ourselves or from others, or from the strategies of the enemy. Good reminder! SO sure about God's protection in these things. Thanks for stopping by, Niki!